EVO, Ti-Coated - Serrated. The Gerber EVO knife was designed to be straight and continuous across the spine and over the handle, thus giving it a dagger-like appearance. 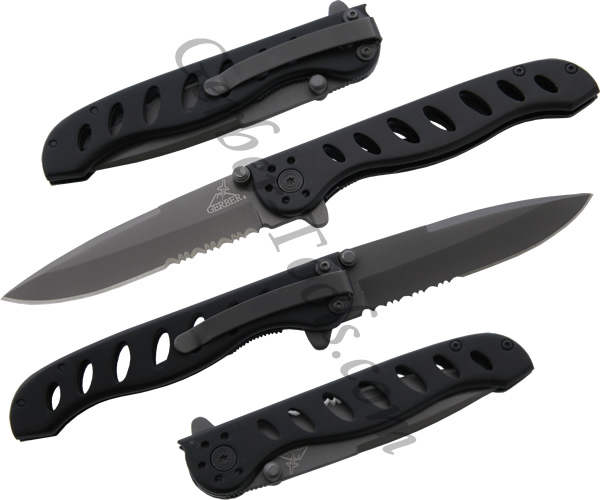 This Gerber 22-41432 model features a partially serrated 440A stainless steel blade that is coated in titanium nitride. The handle is light weight aluminum that has seven holes cut out for good looks and to lighten the knife even further. The blade is held in place and released with a liner lock in the handle. A pocket clip is included for easy carrying.